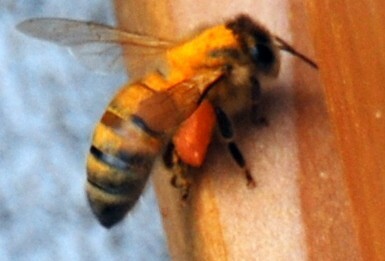 It is truly amazing how far a bee will travel to find pollen, nectar, water and propolis. They will travel 3 to 5 miles in search of sustenance for their hive. When you have a bee hive you can’t think of what is blooming in your yard….rather you need to think what is in bloom in your part of the countryside. I live in Seabeck WA and as you can see my bees travel quite a bit of our zip code. A 3 mile travel distance creates a 6 mile in diameter circle around your hives. A 3 mile radius covers 18,110 acres of ground. A farmer would be proud to be able to cover that many acres and as you know the honey bee is the fraction of the size of a human. My version of a sticky board. 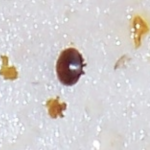 Today I checked Flower Hive for varroa destructor mites. There are several ways to do this, today I chose the least invasive way. My two warre hives have a slide board that I can slide in under the bottom screen. 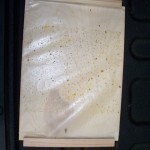 I taped a piece of wax paper onto the board and wiped some olive oil on it with a paper towel. I slid it into the bottom of the hive and left it there for 24 hours. 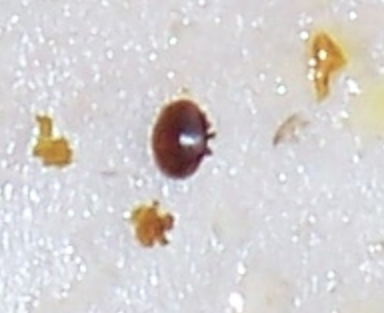 mites. Most hives will have some level of varroa mite infestation but when the drop count gets to 15 to 20 it is time to treat. 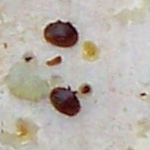 There are quite a few ways to treat for varroa mites. I’ll not delve into those here except to say that they can become pretty chemically invasive. 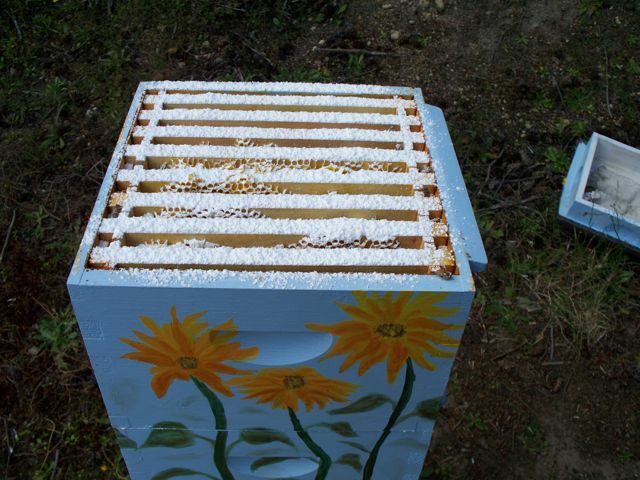 with powdered sugar 1) clogs the suction cupped feet of the mites causing them to fall through the screened bottom board and 2) increases the grooming behavior of the bees so that they clean the sugar and the mites off of each other. 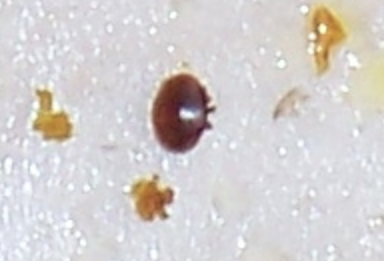 If I had a solid bottom board hive the mites would be more likely to fall to the bottom, shake off the sugar and climb back up on the next passing bee. 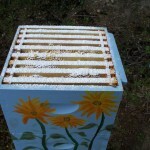 The screened bottom board adds ventilation to the hive and also creates a way for the mites to fall out of the hive. I’ll check in a week or so with another olive oil slicked board to see how well this treatment worked. 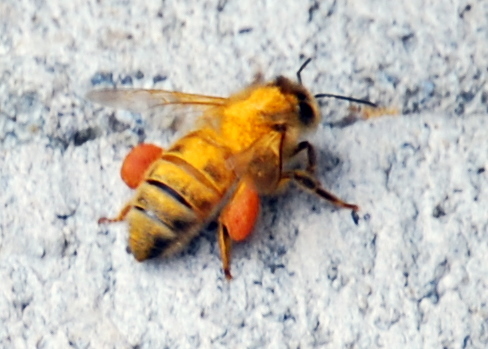 Cheeto bees are a common site this time of year in the Pacific Northwest. 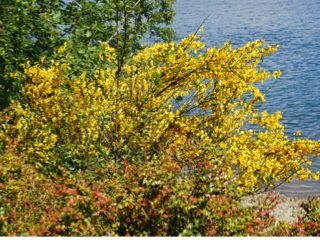 You do not have to look far to see a field of scotch broom in bloom. Once thought of as a good idea to plant along our freeways now many people see this as an invasive plant that is not native to our area. 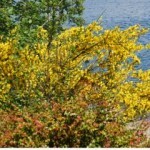 I’ve read several articles that indicate that honey bees do not like scotch broom, yet the ones I see in our neighborhood usually have bees around them and they sure come back to the hive covered in yellow, almost like they had been playing in a bag of Cheetos. Color: color does not really matter though keep in mind that light colors reflect the heat away from the hives and dark colors attract the heat. For me, where I live the darker the better as beeks in our area seem most concerned with keeping their bees alive throughout the winter. If you only have a couple of hives you can afford to get decretive. In our case my wife is painting one and I’m doing the other. She is planning a colorful design while mine will look like a log house, green roof and golden brown sides. If you had 20 hives to paint I’d recommend a spray gun or roller to cover as much territory as quickly as possible….maybe that is one of the benefits of being a backyard beekeeper, small scale. Type of paint: Latex, water based exterior paint. Low VOC would probably be the best but if you used regular VOC paint and let them sit for a few weeks I’m sure there would be no problem. Stay away from oil based paints. 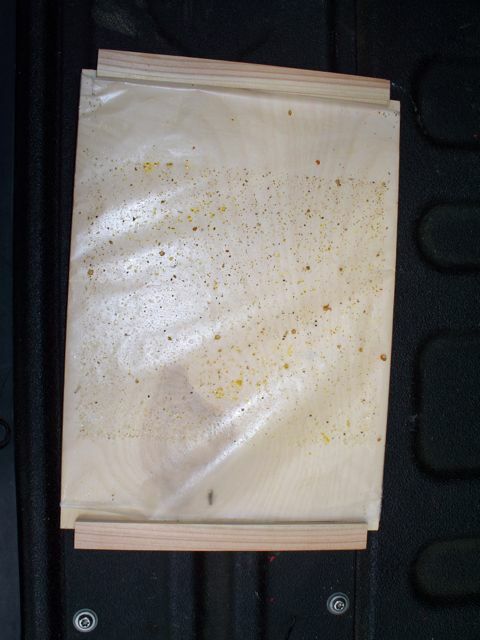 In our beekeepers class they really pushed for you to use leftover paints that you or a neighbor might have left over from your last project. What to paint: Just paint the outside. Do not paint anything the bees will be living on. Your goal is to protect the wood from the elements while realizing that over a few years your hives will age. All of the bars, frames, inside walls, ceiling and floor should be untreated wood. My warres are 16” x 16” so I’m putting down a 16 x 16 inch square paver that I’ll level with sand underneath and then on top of the paver I’m placing two 16 x 8 in cinder blocks side by side with the holes on the side. This way if it is getting stormy I’ll be able to run a nylon strap around the stack and through the cinder blocks to add stability. I’ll post pictures of the paint job as well as how I have them placed in the yard next week. Time never goes so slow as when you are waiting for your first package of bees…..
60 Minuets, Why Are Honeybees Disappearing?